The intended couple come together with the intentions of proclaiming their love for each other. 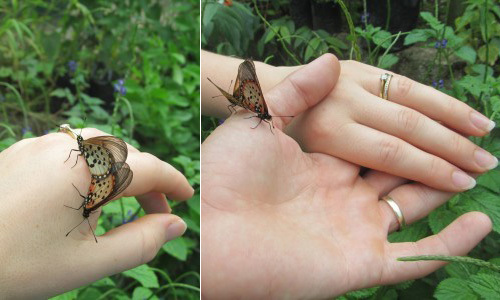 Together, they release a single butterfly to carry forward their proclamations of love to the world. Family and friends, each release a single butterfly of their approval of the engagement of the young couple and upon their wings is carried forward their blessings and hopes for the young couple’s future. “Yesterday a butterfly, Came floating gently through the sky. He soared up through the atmosphere, Then drifted close enough to hear. I said, “I’d love to fly with you, And sail around the way you do. It looks like it would be such fun, To fly up toward the summer sun. But I have not your graceful charm. I haven’t wings, just these two arms. I’ve been designed to walk around. My human feet must touch the ground. Then magically he spoke to me and told me what his wish would be. To squish it’s mud between my toes, Or touch my finger to my nose. And so we went our separate ways, In wonder and surprise. Friendless and all alone, On this unsweetened stone. Whose happy heart has power, To make a stone a flower.